DoNotChange ransomware uses sophisticated techniques to infiltrate computers and hide from its victims. Use Reimage to determine whether your system is infected and prevent the loss of your files. What should you know about DoNotChange ransomware virus? What should I do after DoNotChange ransomware attack? DoNotChange ransomware (also known as .Do_not_change_the_file_name.cryp file virus) is a brand crypto-malware that demands to pay 400 USD for data recovery. After infiltration, this cyber threat might make modifications in Windows Registry in order launch itself every time the users turn on the infected computer. What is more, the virus might also delete Shadow Volume Copies in order to make data recovery nearly impossible. Thus, in this way authors of the DoNotChange malware expect to receive more ransoms. Once the virus finishes encoding targeted documents, audio, video, image, text, and many other files, all of them have .Do_not_change_the_file_name.cryp file extension. In order to get back access to their personal files, victims are expected to follow the instructions provided in the bilingual “how_to_decode_files!! !.txt” ransom note. However, if you get infected with this piece of malware, you should not do that. All ransomware viruses must be treated similarly. You need to remove DoNotChange virus from the device immediately. Reimage or other professional malware removal program will help you to get rid of the infection safely. DoNotChange ransomware virus demands to pay 400 USD in order to recover encrypted files. DoNotChange ransom note is written in the Russian and English languages. The examples of them are posted on Pastebin. The ransom note warns that changing file names will make data recovery impossible. Thus, victims are supposed to email their unique ID number to robert.swat@qip.ru address. Within 10 hours they should receive the answer with detailed instructions what they have to do next. There’s no doubt that they will receive particular Bitcoin wallet address where they need to transfer the ransom. However, authors of the DoNotChange ransomware virus also suggest emailing them again if victims do not receive the answer after 10 hours. Keep in mind that there’s always a risk that cybercriminals won’t contact you back. File-encrypting viruses are an illegal money making projects that are interested in profits only. Thus, you might lose both, your files and 400 dollars. Obviously, we want to discourage you from taking this risk and want to suggest performing the DoNotChange removal. You might be able to restore at least some of your files using additional recovery methods. All ransomware viruses spread similarly. Hence, DoNotChange ransomware might also use a combination of the main distribution strategies, such as malicious email attachments, malvertising, exploit kits, bogus software updates and unsafe downloads. Thus, there are many ways how you can get infected with a file-encrypting virus. A malicious payload might be delivered straight to your inbox, or you might install it along with a fake update. What is more, clicking on interesting ads or browsing through insecure websites might also increase the chances to encounter ransomware. However, if you follow security tips and backup your files, you don’t need to worry about anything. In order to avoid DoNotChange hijack and other malware, you should behave carefully when browsing the Internet. Always double-check the information before opening email attachments, do not browse through gaming, gambling, adult-themed and other potentially dangerous websites, avoid clicking ads and links received on various communication channels. To maximize computer’s security level, you should install reliable anti-virus software too. If you ever get infected with the DoNotChange virus, you should focus on its removal immediately. Ransomware viruses belong to the hazardous group of cyber infections. Apart from damaging your files, they might also cause other computer-related problems. For instance, it might open the backdoor for other malware that can continue decrypting files or try to steal your personal information. Thus, it’s better to rush with DoNotChange removal. Elimination procedure requires installing reliable anti-malware program, such as Reimage or Plumbytes Anti-MalwareMalwarebytes Malwarebytes. Of course, you can choose your preferred tool as well. However, don’t forget to update it before running a system scan! 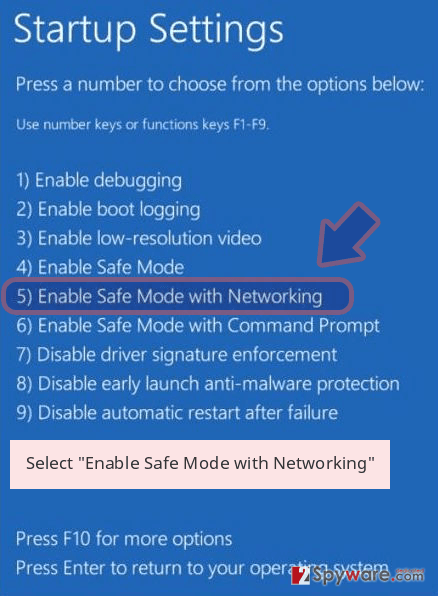 Besides, you may also need to reboot the device to the Safe Mode in order to disable the virus first. Below you will find an explanation how to do it. Once you remove DoNotChange virus automatically, you can look up for data recovery solutions. Check our suggestions below. Ransomware viruses tend to block access to the security tools. 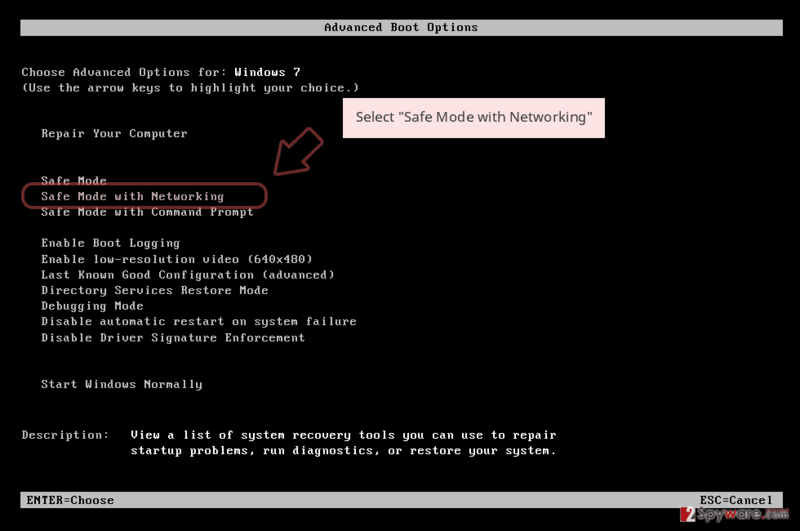 Thus, in order to remove DoNotChange virus automatically, you need to disable the virus first. 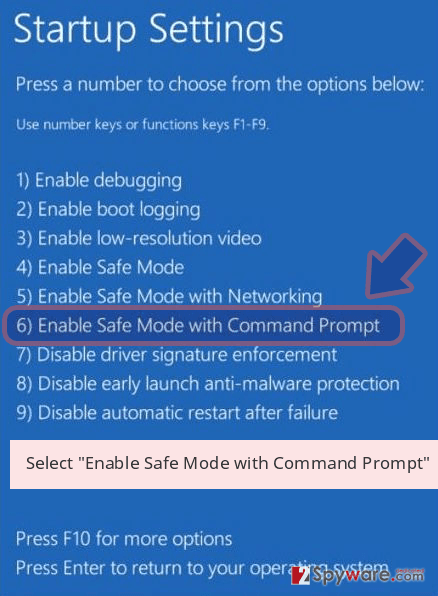 Follow the steps below and run a full system scan with reputable malware removal program. Log in to your infected account and start the browser. Download Reimage or other legitimate anti-spyware program. Update it before a full system scan and remove malicious files that belong to your ransomware and complete DoNotChange removal. 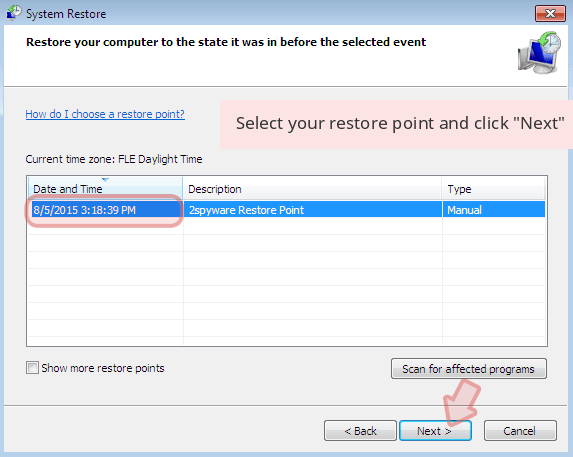 System Restore method also helps to disable the malware. Follow these steps in order to install or access malware removal program. 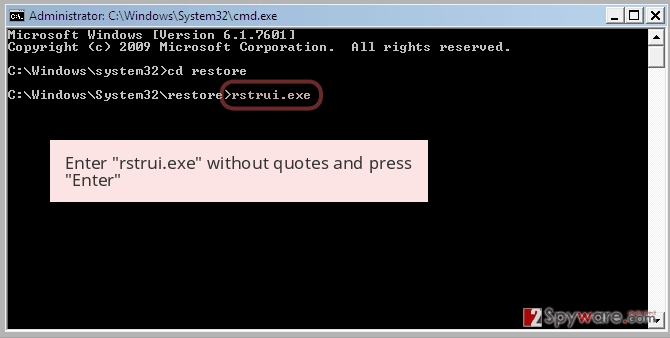 When a new window shows up, click Next and select your restore point that is prior the infiltration of DoNotChange. After doing that, click Next. 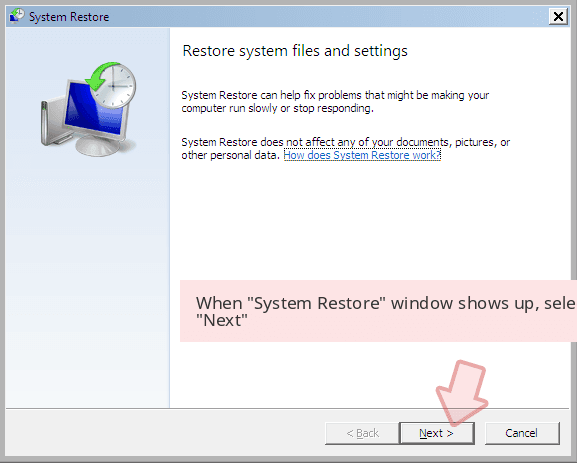 Once you restore your system to a previous date, download and scan your computer with Reimage and make sure that DoNotChange removal is performed successfully. Guide which is presented above is supposed to help you remove DoNotChange from your computer. To recover your encrypted files, we recommend using a detailed guide prepared by 2-spyware.com security experts. At the moment the only safe and reliable method to recover your files is using data backups. However, if you do not have them, you have two options – wait for the free decryptor or try additional data recovery methods. We believe you should go for the latter option. The methods presented below might help to recover at least some of your files now. This professional tool is designed to restore corrupted, deleted and encrypted files. Developers often update this program in order to help victims of ransomware. We cannot assure that it will restore all your files; however, some of them should be rescued. This feature allows traveling back in computer’s time. 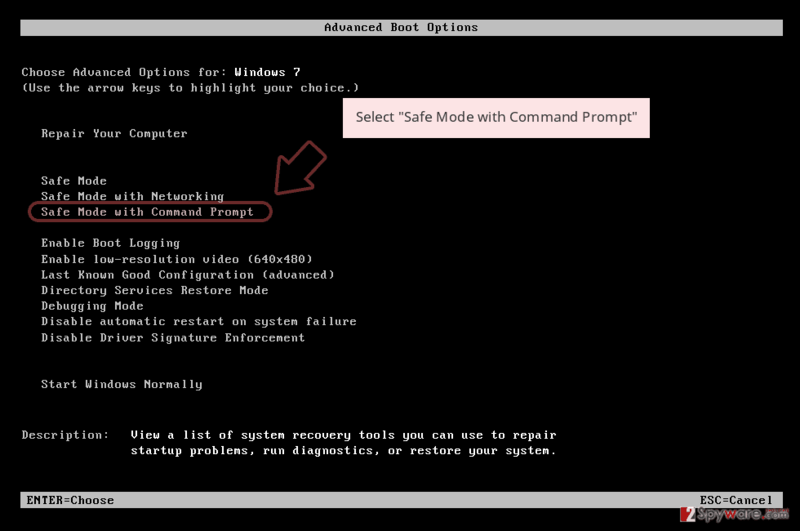 Thus, if System Restore function has been enabled before the DoNotChange attack, follow the steps to copy previously saved versions of the encrypted files. Otherwise, this method is not helpful for you. DoNotChange might delete Shadow Volume Copies that are crucial in order to apply this method. However, sometimes ransomware fail and leave shadow copies. In this case, ShadowExplorer will help you. The official DoNotChange decryption program hasn’t been released yet. ^ What is the Windows registry? Why is it so important?. Little Apps. The website includes various PC tools and information on computers. ^ Clay Levering. What is Volume Shadow Copy (VSS)?. 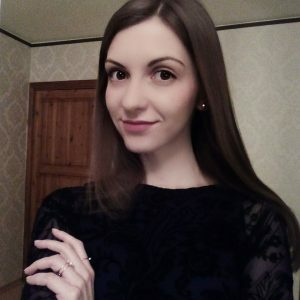 NovaBACKUP Blog. Backup Software for Windows Servers. ^ Brianna Gammons. What to Do When You've Been Hit With Ransomware. Barkly Blog. The latest endpoint security news, tips, and actionable insights. ^ Pastebin. Computer Hope. Free computer help and information. ^ How Ransomware Spreads and Works. Combofix. The official website of the freeware. This entry was posted on 2017-03-30 at 00:24 and is filed under Ransomware, Viruses. You can quickly scan the QR code with your mobile device and have DoNotChange ransomware virus manual removal instructions right in your pocket. How did you remove DoNotChange virus?